Don’t ask me why in the world I decided to make a soup in the middle of August. What can I say…when the recipe inspiration strikes, I feel the need to make it right away. I love leek and potato soup and recently I found a recipe for a cauliflower and leek soup that looked promising. I decided to combine the creaminess of leek and potato soup with the health benefits of cauliflower and the results were delicious. Don’t get me wrong, I wouldn’t exactly call this recipe low cal, due to the crispy potato and cauliflower topping and brown butter drizzle, but this topping is an essential component if you ask me. There are those soups that are good on their own and then there are those soups that are made infinitely better by the toppings you add to them. This soup would fall into the latter category. 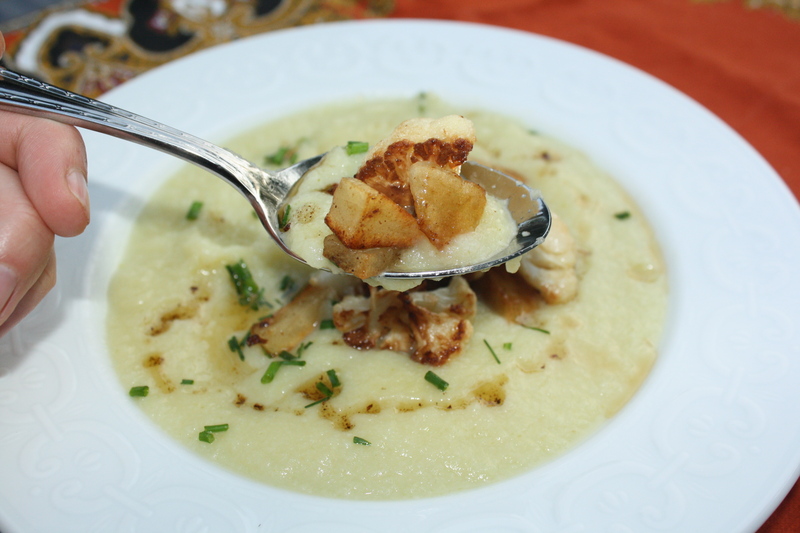 The base of the soup would not be anything special, but the crispy potatoes and cauliflower, fresh chives and brown butter take it over the top. It’s even worth making in the middle of August. 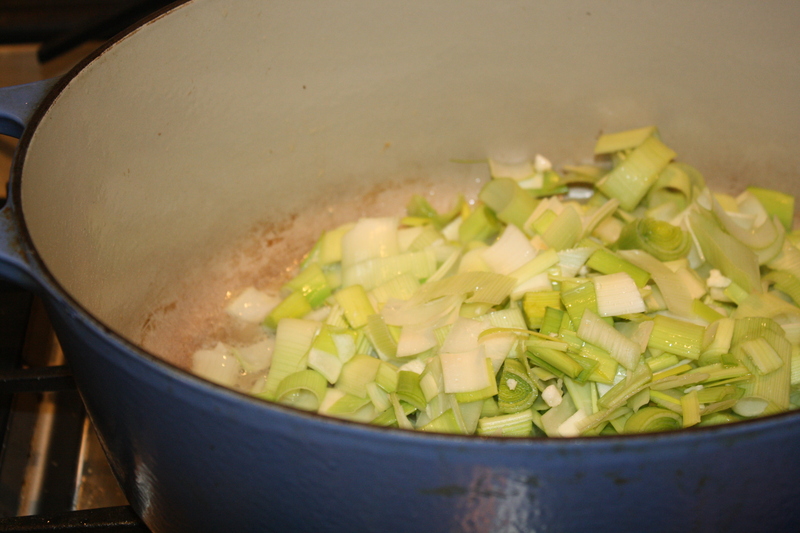 You’ll start with 4 leeks that have been chopped and washed and saute them in a few tbsp of butter until softened. Add 2 diced idaho potatoes and part of the cauliflower to the pot. Pour water over the top and bring to a boil. 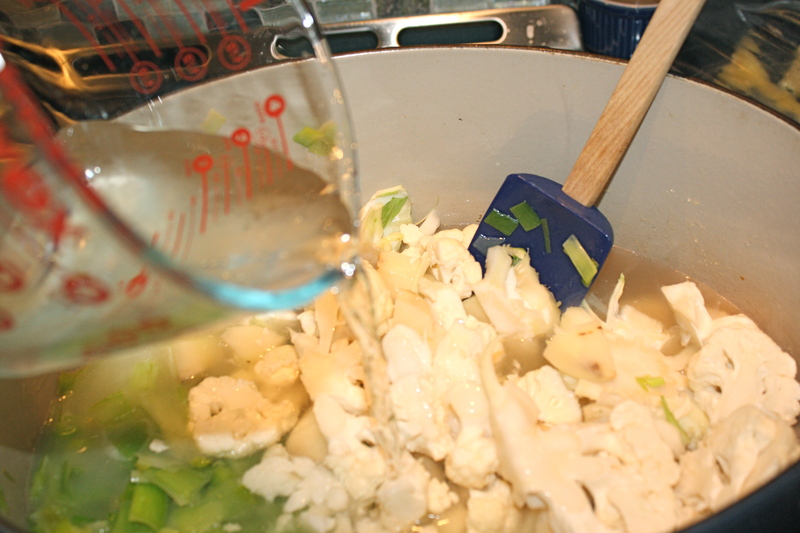 Reduce to a simmer and cook for half an hour until the vegetables are soft. At this point, you will add one additional cup of cauliflower florets and cook for another 20 minutes. While the soup is cooking, saute 2 finely diced idaho potatoes and 1 cup small cauliflower pieces until they are crispy on the outside and soft on the inside. Using a slotted spoon, remove the vegetables from the pan and reserve the browned butter. Puree the soup in a blender or with an emersion blender. Serve topped with the potatoes and cauliflower, freshly chopped chives and a drizzle of the reserved brown butter. Remove the outer leaves from the cauliflower and use a paring knife to remove the core. Thinly slice the core and set aside. Reserve 1 cup of florets for the topping and slice the rest for the soup. Saute the leeks in 3 tbsp of butter until softened. 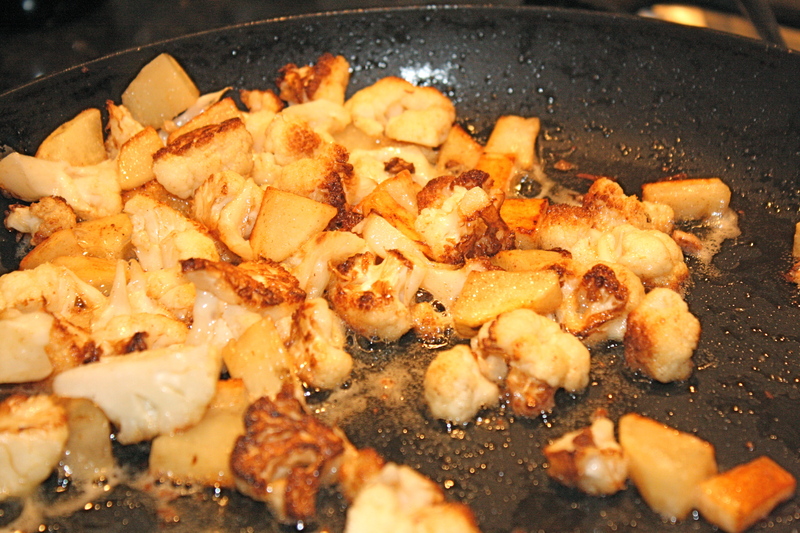 Add 2 of the chopped potatoes, the sliced cauliflower core and about half of the cauliflower florets. Pour 4 1/2 cups water or broth over the vegetables and season with salt to taste. Bring to a boil and then reduce to a simmer. Cook for 30 minutes and then add remaining sliced florets. Cook for another 20 minutes. While the soup is cooking, saute the remaining potatoes and 1 cup reserved florets in 5 tbsp butter. Cook until well browned and soft in the center. Season with salt and use a slotted spoon to remove the vegetables. Reserve the butter. 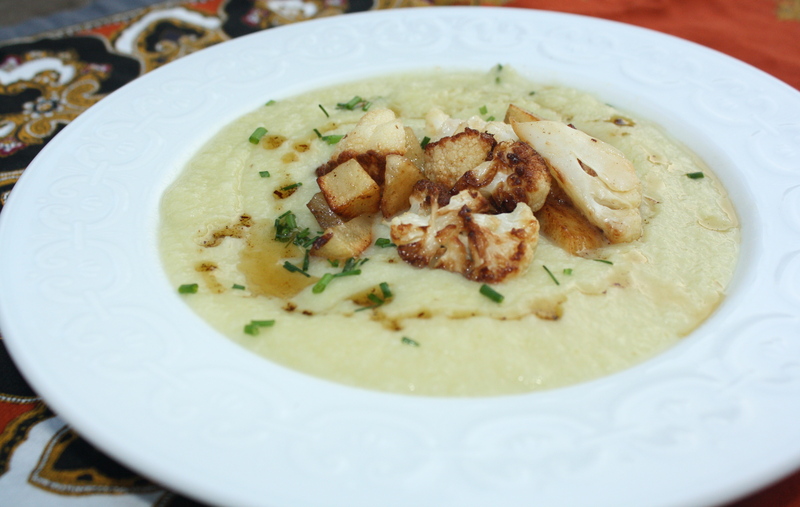 Blend the soup in a blender or with an emersion blender until smooth and serve with the browned cauliflower and potatoes, fresh chives and a drizzle of the brown butter. Soups are SO good! I made something like this before. Sometimes fall just can’t get here fast enough! Looks delish!